This pretty set of “toys” can be stitched and sewn and and personalized to your own taste. Use the crystals you have at hands, sew on genuine Pearls from a broken necklace – use an antique button as head of the tassle – there are many options to make this as pretty as YOU like ! 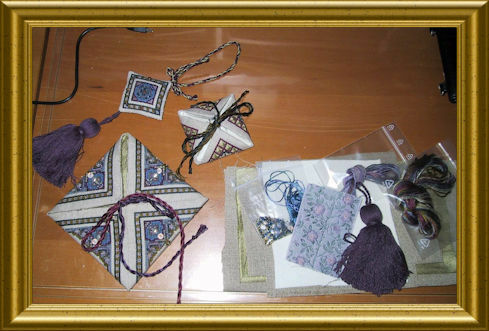 Mostly cross stitch you will stitch a few Special Stitches, use normal cotton threads as well as hand-dyed,variegated Silks, braids, beads and crystals. I am sure you will have some pretty lining fabric at hands… be it silk or cotton. Pictures of the then-workshop-model are enclosed in your download for finishing help and ideas – but you will see that you can easily do your own. 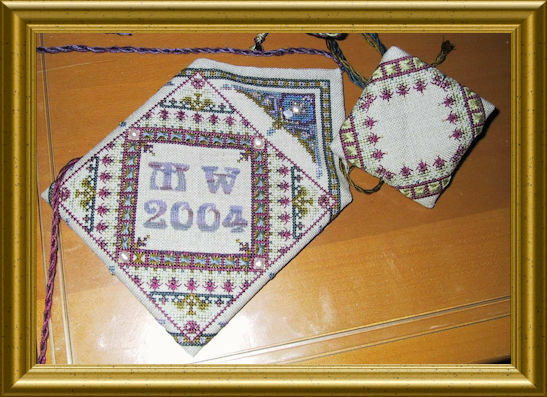 As this was a class piece in 2004, the materials from then are not longer available and heave been substituted by commercially available threads etc.